Supporting Network Named User Licenses. Case study – MATLAB. Organizations normally acquire software licenses in pools, and may have specific licenses present in multiple pools. Such is the case when the organization’s software assets are a hybrid of Node locked, Named and Floating licenses. In such cases, the association of a checked-out license to a specific license pool becomes unclear. This obscurity is particularly disturbing given the fact that Floating licenses are normally more expensive than Named licenses, and so keeping track of license consumption and billing is compromised. OpenLM Version 3.0 provides a solution to this problem, and enables detailed usage reporting in a hybrid license-type environment. See the image below for reference. In OpenLM Version 3.0, the complete list of FlexLM Options’ files keywords and parameters has been integrated in the OpenLM Options file extension (e.g. : asset_info, VERSION, HOSTID, EXPDATE, KEY, SIGN, ISSUER, NOTICE, VENDOR_STRING, dist_info, and user_info). OpenLM can now enforce license usage according to predefined license pools, by means of the asset_info parameter. 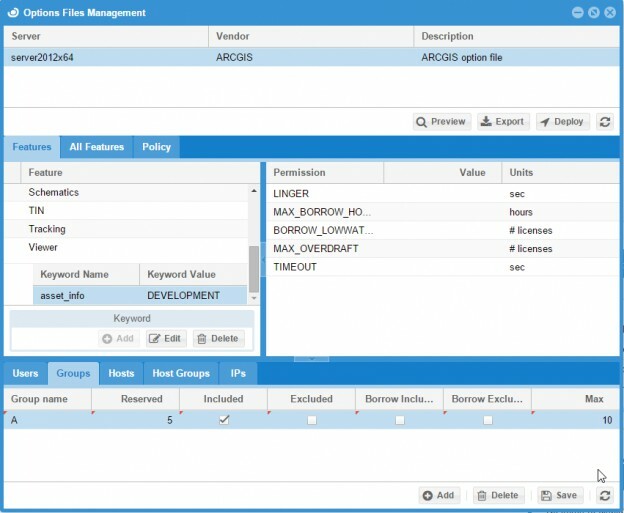 OpenLM provides a comprehensive solution for keeping track with changes made on the Organizational Active Directory, Applying these changes to FlexLM Options files, and reporting historical and concurrent license usage according to license types:”Named Licenses”, “Node Locked Licenses” and “Floating Licenses”.